Where the road crosses Pine Creek a visible side trail is found descending into the wash, just by the “Tunnel Ahead, Prepare to Stop” sign sits. 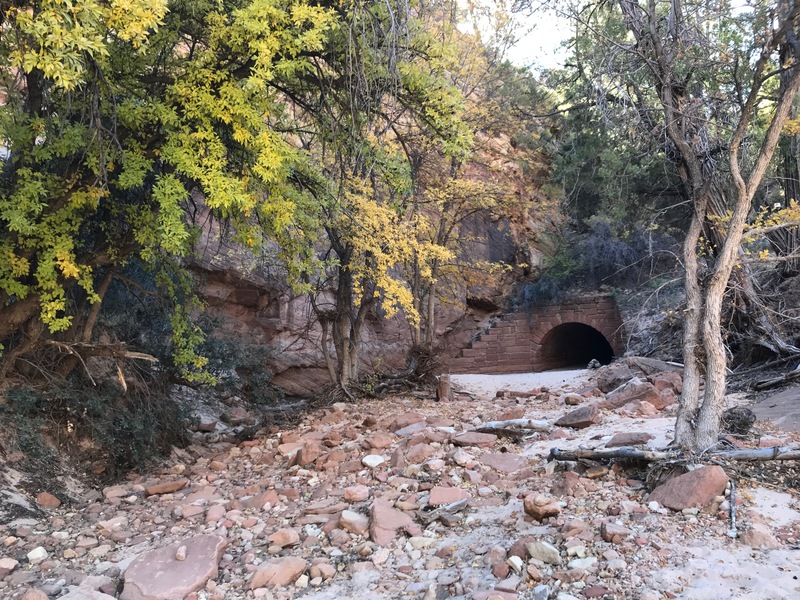 It leads down to a quaint bricked hole for Pine Creek to run under the road. 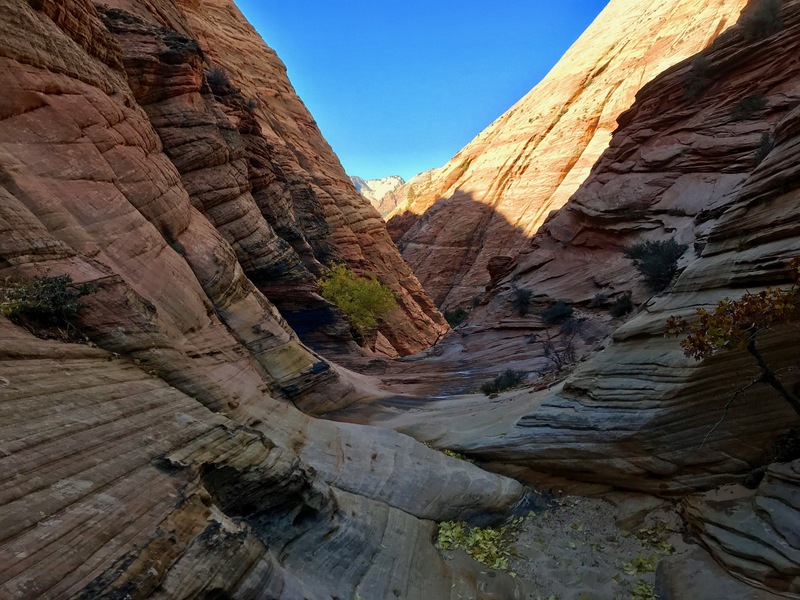 The wash, as with most of the upcoming canyon is bedded with a fine, lightly tan sand commonly found in Zion. 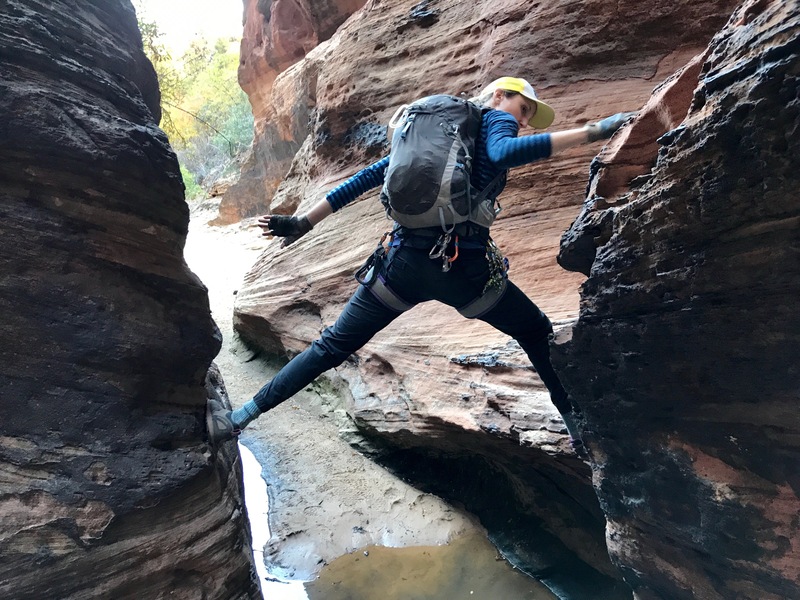 Half a mile up creek, the canyon narrows and a gray watercourse leads an accessible way upwards with some 3rd class climbing. 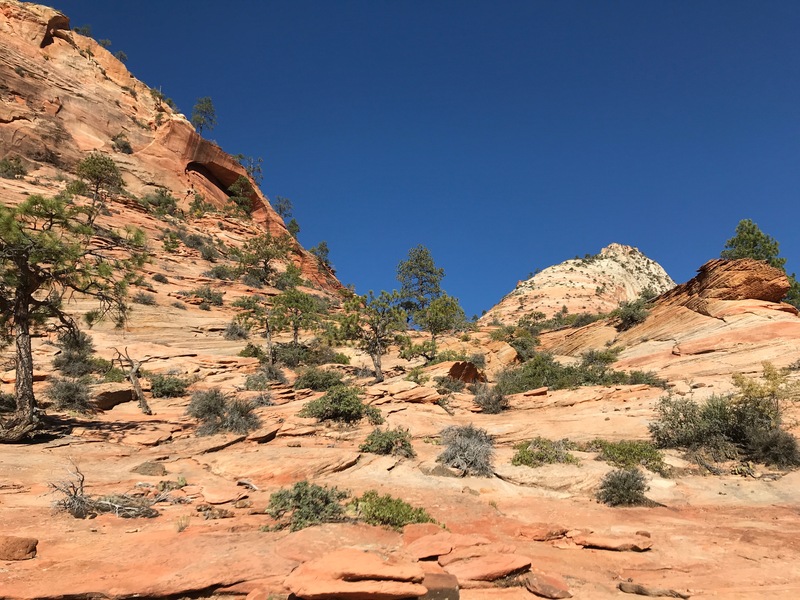 The gray yields to tan sandstone amid many bushes. Continuing upwards for a half mile of hiking, the prominent white butteress of Deertick Mountain appears on the right as the stone turns to orange for a hundred feet of steeper 3rd class climbing. There are supposedly petroglyphs here but spreading out and looking for them yielded no results. 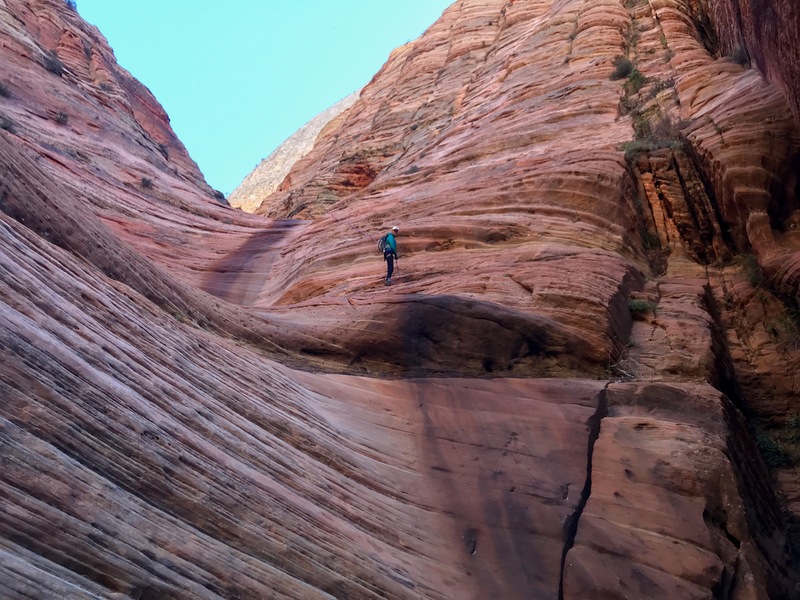 View as you just come out of the wash.
Over this steeper climbing, the view of a terraced red wall hangs in a canyon view. 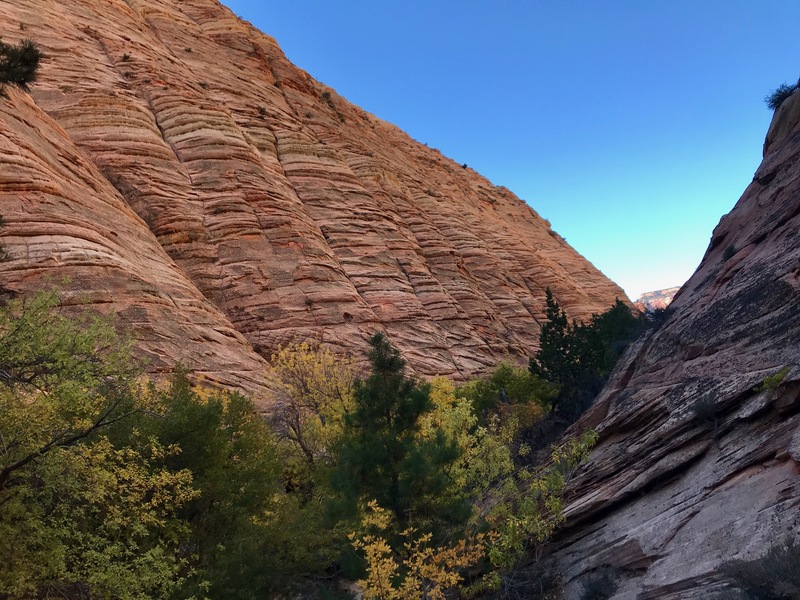 This is Spry Canyon. The descent into the canyon favored many tough, abrasive desert bushes waiting to reach out leave their memory on your skin. 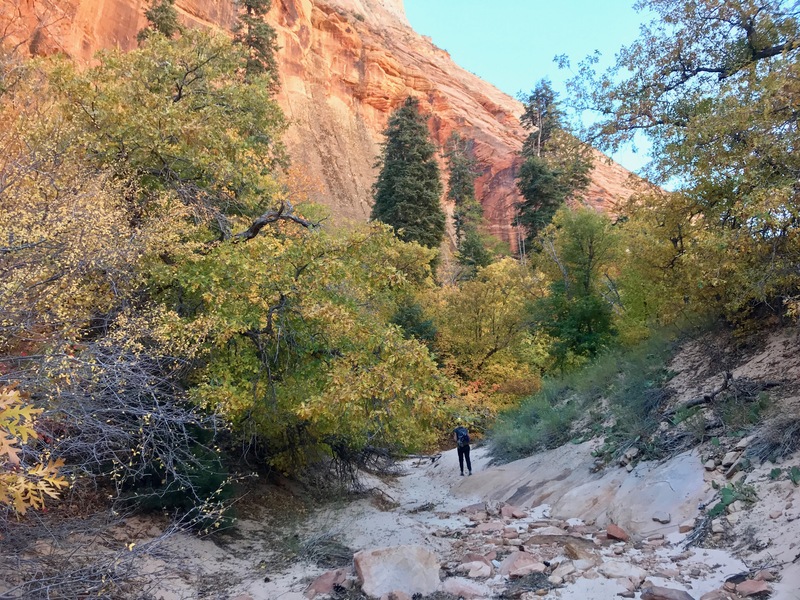 Once in the canyon’s windy, sandy watercourse the desert scrub gives way to softer trees with changing leaves along the banks. 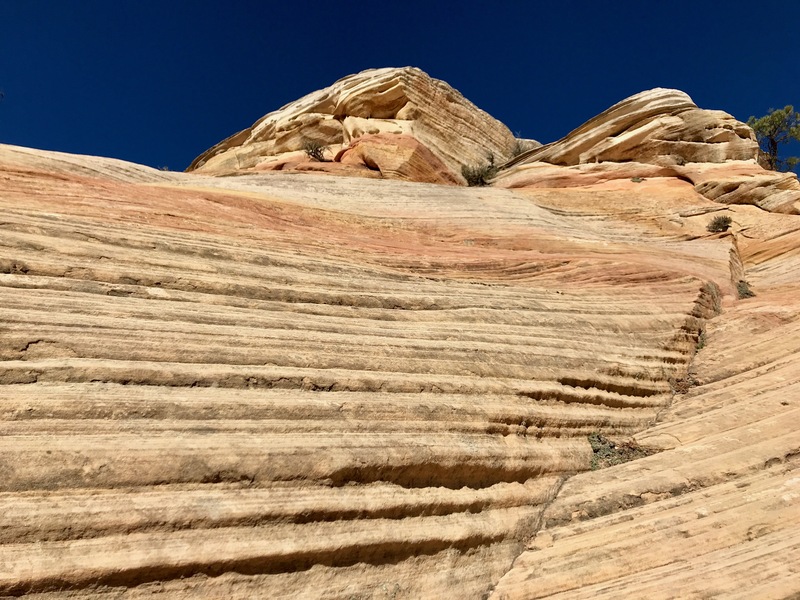 The sand is peppered with the foot depressions indicating the popularity of this canyon. The chill from the new canyon shade results in gaining another layer for the next several hours. A while later the sand splits, with most feet depressions going right. The left branch is probably faster, but we would have missed examining the smooth smiling white skull and jaw of a deer placed in a tree. 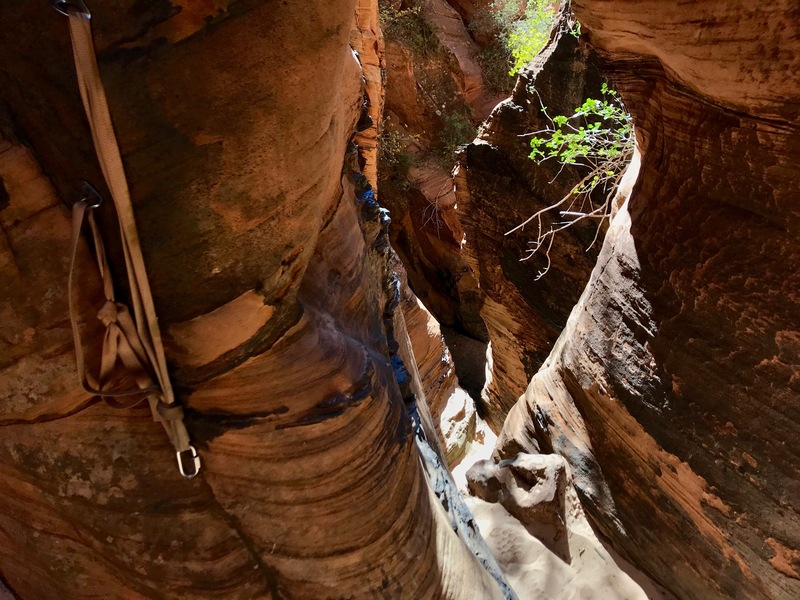 After the skull-tree, the trail takes a well traffic’d dirt trail through trees to rejoin the wash just before the canyon opens up into a beautiful sandstone canyon for the first rappel down a dark water streaked slope. 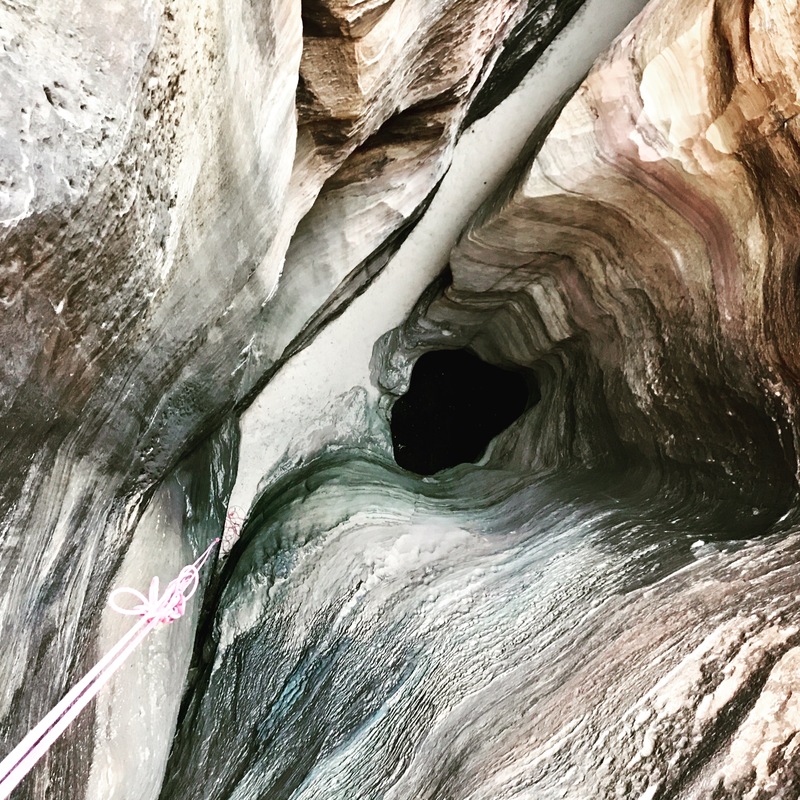 Bypassing a small pothole on the right, I downclimbed the last 15 ft with our 70m rope first in the chimney and then the crack below the bolt station after passing up the rope to my partner. The crack felt more secure but only a rock climber who climbs crack might think that. 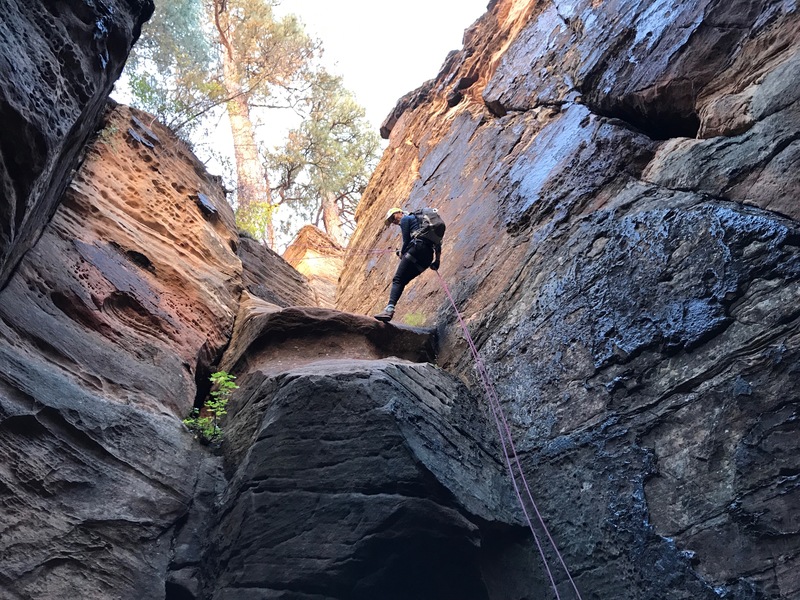 My partner rappelled off a bush-stump thing the rest of the way down, feeling insecure on the sandstone. This was the only rappel our 70m rope would leave us short. 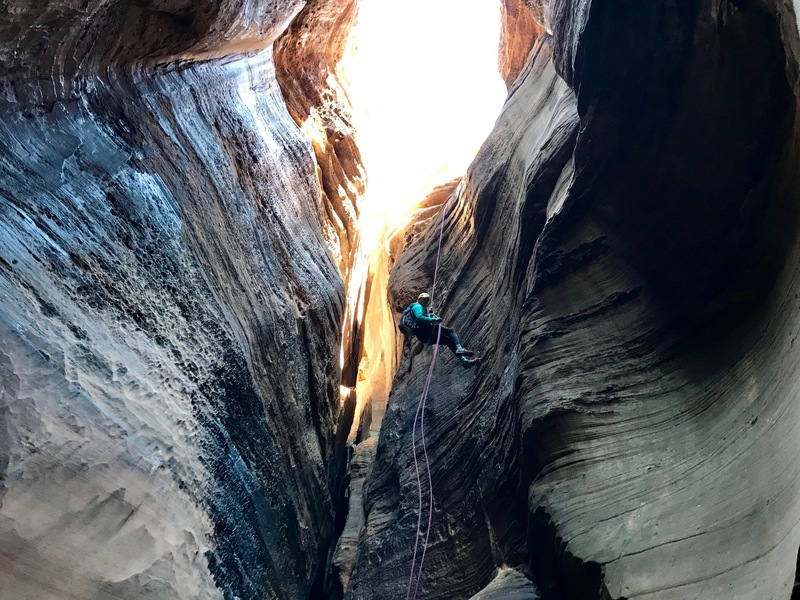 The canyoneering portion has started! 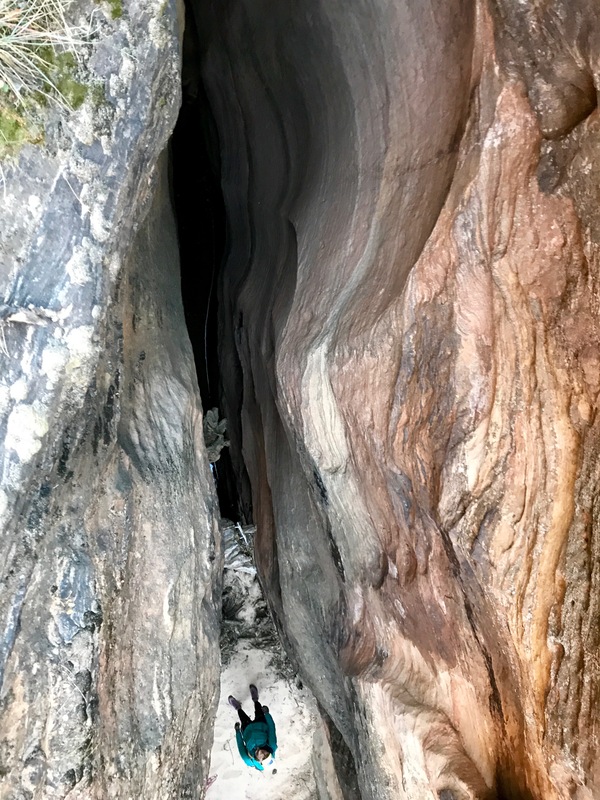 A several foot wide narrow slot appears: After a couple 10 ft downclimb / rappel sections a black, dark slot with a rap off stuck log drops into water that extends for 20 ft. 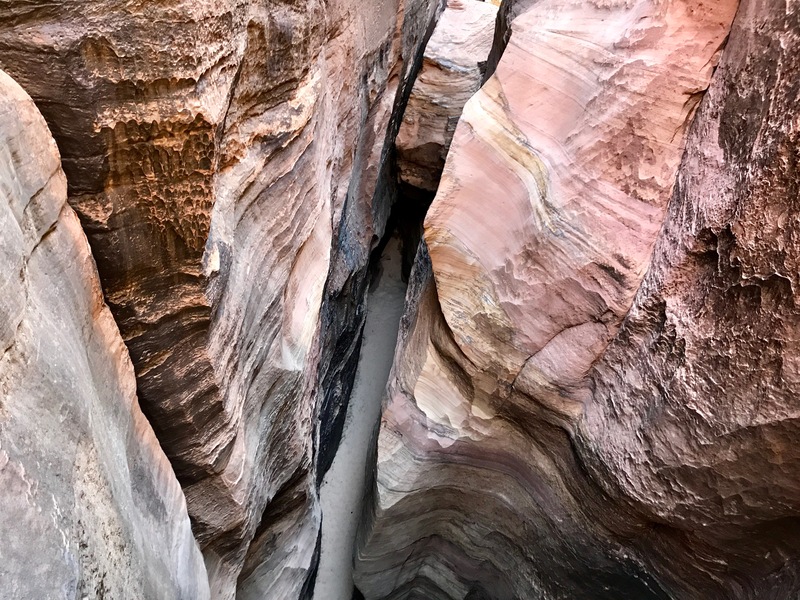 This pool and the short, interesting slot can be bypassed entirely by walking around the slot on the right without rappel or left with a longer (30m?) rappel. 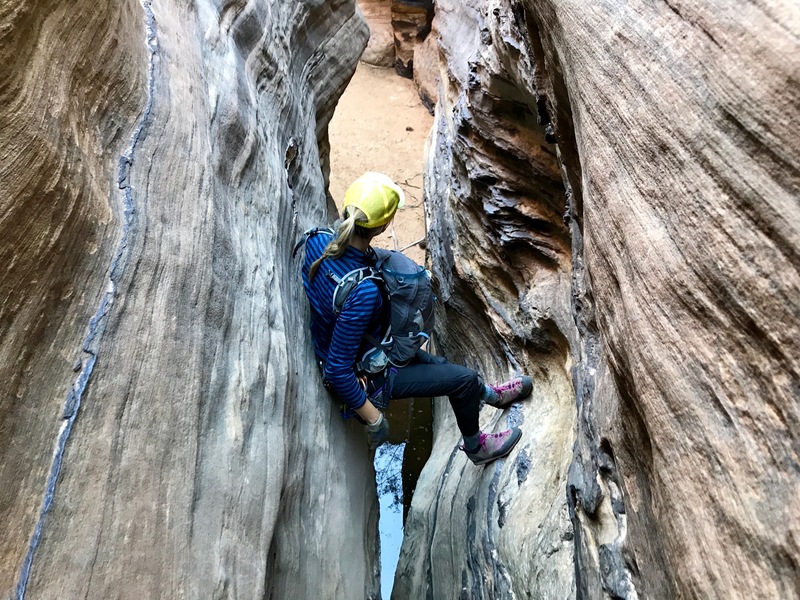 Compromising between dry feet and exploring a tighter canyon, we rappelled off a larger tree (no webbing) into the middle, just after the pool and jumped over another short water section. The rope wear on the rock showed this as typical. 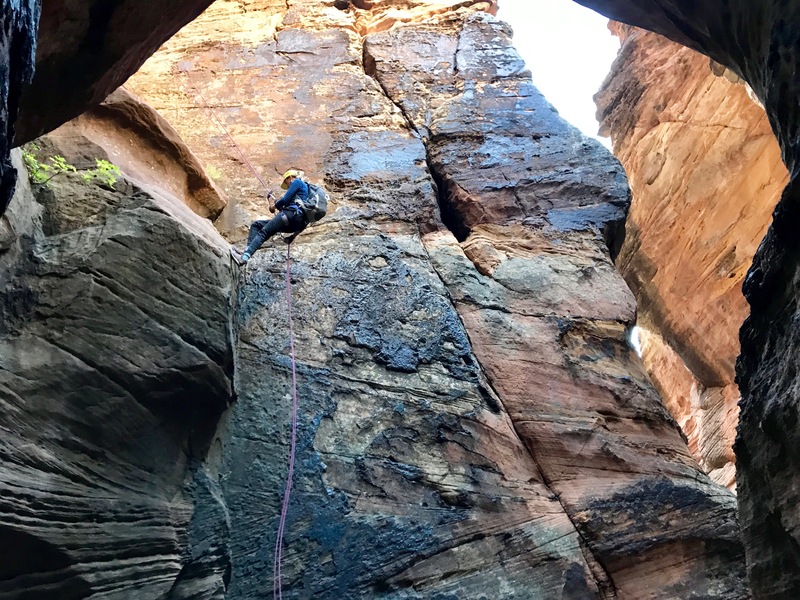 Some downclimbing, a stem over water and a short (10m), fun, drop in, free hanging rappel brought us to my favorite rappel of the day. 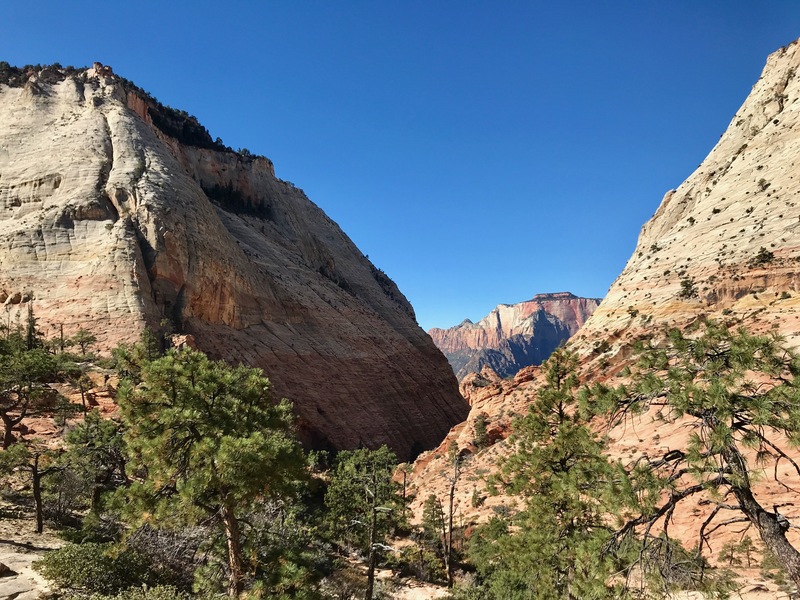 Before us, the canyon sinks deeper into a deep, dark slot with incredibly slick black sandstone sides. Lowering over the side I feel like I am descending into an obsidian hole. This is followed by another straightforward rappel. Next, there is a rappel into a cool flute with water in the bottom that soaked our rope but we were able to avoid. Not so for the waist deep pool awaiting down the handline to reach the next rappel. The sides around the pool were wide but I miraculously was able to bridge the water the whole way and avoid the pool unlike the five wet people in front of me. Sadie chose to accept her wet fate rather than risk falling in from a wide stem and waded the section. 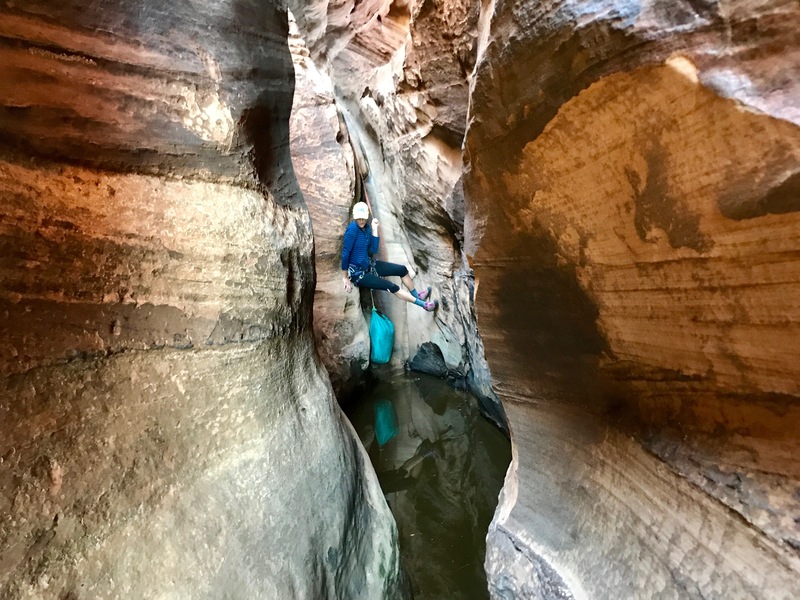 This pool is unlikely to become any more than a foot deeper in higher water season because after this wade the slot pours over the next rappel. 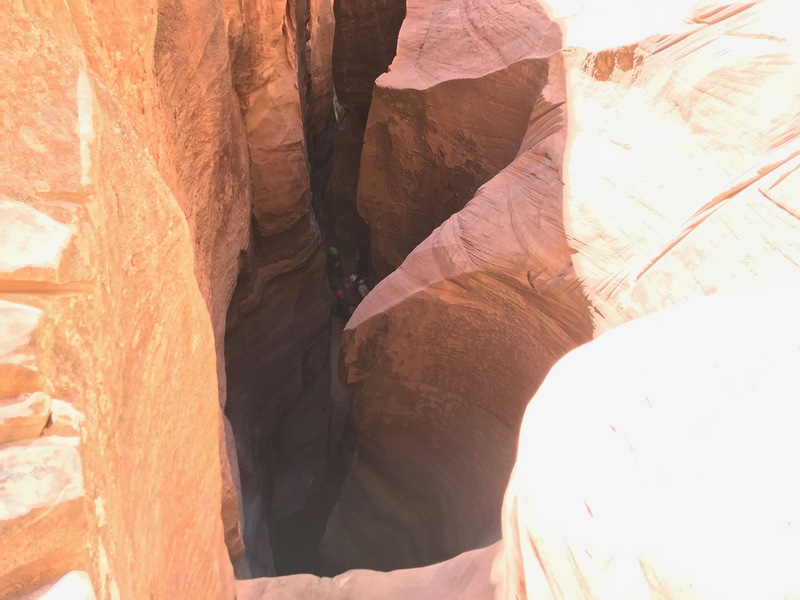 Aside from this wade, we would have done the canyon dry, however, it looks like if you would have scrambled right before heading down the flute you could rappel a sling block directly onto the next rappel and skipped this section. 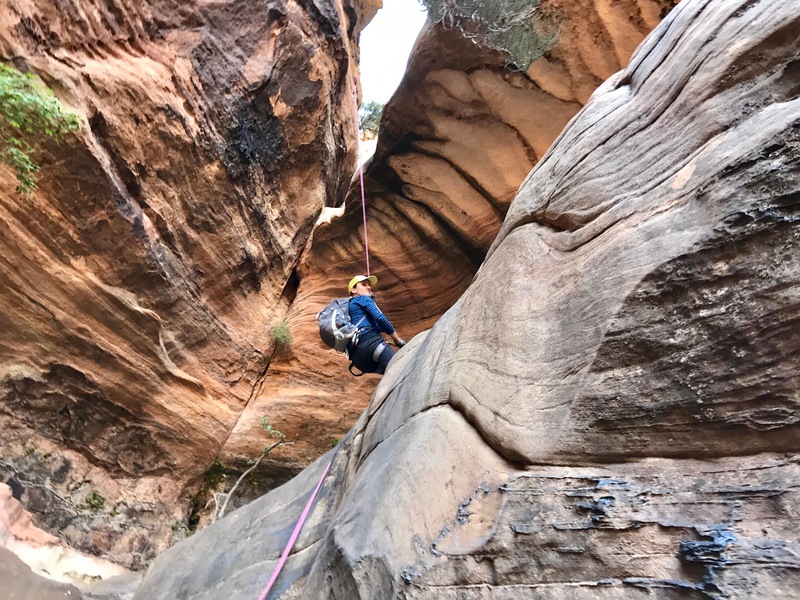 As with other rappels in Spry, skipping the water often also means skipping the coolest tight rappels. 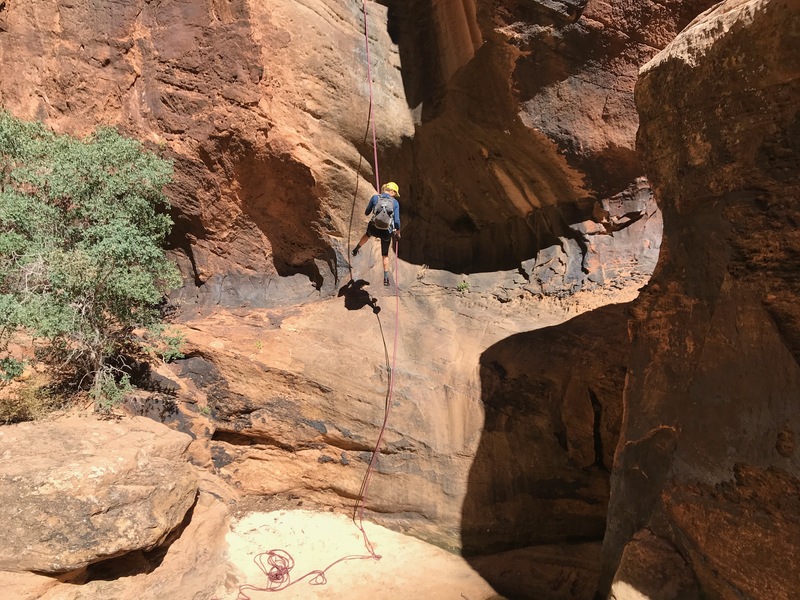 Out of the pool and over the next rappel there is a mundane, sunny and hot boulder hop for 1/4 a mile before ending in a 33m rappel to ground. Another 20 minutes of boulder hopping leads to the Pine Creek and an easy sand trail back to the road. We hitched back to our car after walking the road and trying for 20 minutes. Great day. Last rappel of the day!